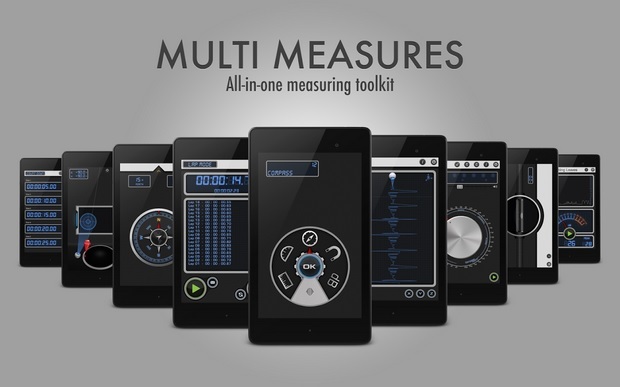 Multi Measures is a set of handy and elegant measuring tools kit. It turns your smart device into a swiss-army-knife that measures everything you will ever need Currently, there are 12 tools in the bundle kit, including: compass, decibel, teslameter, metronome, stopwatch, timer, seismometer, plumb bob, surface level, spirit level (bubble level), ruler and protractor. Taking advantage of the built-in accelerometer, this seismometer tool detects and visualizes any vibrations and moves of the device. So, why not using this excellent feature to help your device self-protected like a car when combined with an alarm? Or another great application is to test how smooth the car is on a test drive. And of course, why not earthquake detection as well? Have you ever forgotten your protractor at school or when you urgently look for a protractor to measure any kind of angles in real life? This is the exact protractor for what you need.